CURRAGH CARRON OIL fed daily will support good skin and coat condition giving a healthy bloom and look of vitality. It is fortified with Calcium Hydroxide which assists the digestive process by keeping it lubricated. It makes an ideal feed oil when changing feeds (e.g. from a soft feed to a hard feed). 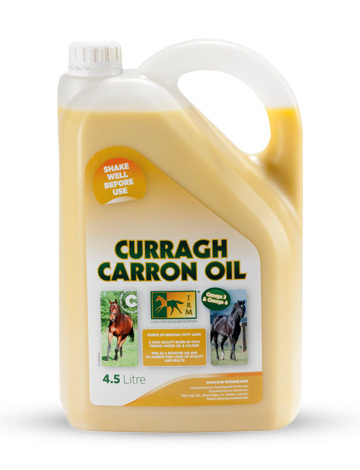 Curragh Carron Oil is a valuable source of energy, getting more calories into the horse's ration while reducing the volume of feed for colic-prone, insulin-resistant and laminitic animals. It is a major source of Essential Fatty Acids (EFAs) in particular Omega 3 and Omega 6. Horses cannot produce these fats in their body, and very few stabled horses today have access to a natural feed supply with balanced EFAs. Both Omegas 3 and 6 are critical for health, and have important structural and functional roles in the body. Research has shown that providing EFAs in the diet assists in maintenance of healthy body systems.